Have you ever seen a flower with two colors on one blossom? Yes, of course you have. Have you ever seen a flower with two colors on one blossom where the colors are divided exactly down the middle? Now that’s a little more rare. How this occurs is an interesting process. Let’s briefly review how a flower is formed. Think back to your high school biology. Plants are made up of small, microscopic structures called cells. The cells grow and divide over and over again until you have a fully formed plant. Inside of the growing tip of a bud (called a meristem) there are many many cells dividing like crazy in order to get a flower to form and blossom in one growing season. Each time they divide, they pass on a blueprint of how the flower is to be built. This is called genetics. All of those millions of cells start out as just one cell. That one cell divides into two cells. At this very early stage, something happened to one of those two cells. The genetic blueprint didn’t get copied exactly right, the blueprint says it is supposed to be a Mum blossom but instead of painting it yellow, it specifies pink as the color. All of the descendants from that one pink cell “thinks” the flower should be pink, while all the descendants from the yellow cell know it is supposed to be yellow because it is a yellow Mum. Those darn pink cells are stubborn and continue with their pink idea until the flower is completely built. And guess what? Exactly half of the flower is pink and the other half is the color it is supposed to be…yellow. In the horticulture trade this is called a chimera. This is one way how different varieties are begun. An observant grower will notice something unusual happening with a single plant, often just a single stem on a plant. If it looks promising, he will reproduce it and hopefully turn it into a new variety. If he has a crew of farm hands helping and he doesn’t go to check his crop, this small detail will more than likely go unnoticed and the opportunity to create something new will be lost. Chimeras don’t always reproduce themselves very well. They are unstable, which is how they became chimeras in the first place. A couple examples of chimeras include thornless raspberries and different colors of Poinsettias. 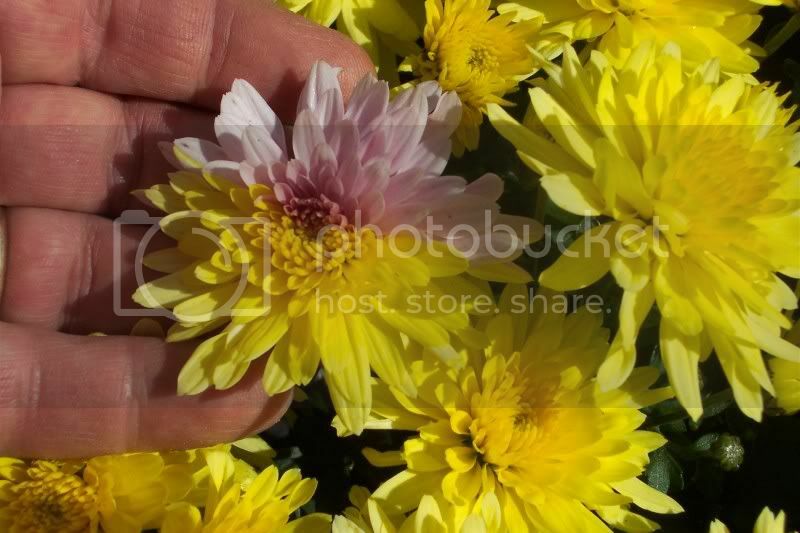 So, will I make a million dollars producing pink and yellow Mums?….probably not. A couple of weeks ago I had an early morning visitor to the garden. Actually I believe he stayed over night until I found him in the morning. He reminded me that gardening can have many pleasent surprises. Sometimes, things come your way unexpectedly. It was still pretty chilly out, the sun wasn’t very high in the sky, so he was still resting on one of the potted Mums we are growing. I knew he would be leaving as soon as he could so, I hurried in to the garden shed to grab my camera. The visitor was a dragonfly covered with so many droplets of dew that he looked like he was encrusted with jewels. I know I’m not the only person to be delighted by this sight. The American Society of Jewelry Historians has a brooch in their collection made of gold, platinum, demantoid, ruby and diamond. It was made by Emmanuel Gattle & Company way back in 1900. I’m sure the designer was inspired by a dragonfly he saw. I imagine him being given an assignment by his boss to come up with an idea for a new piece of jewelry. He was probably unable to sleep all night and got up before breakfast to take a walk in the garden. He looked over and saw… well, we know the result of what he saw. 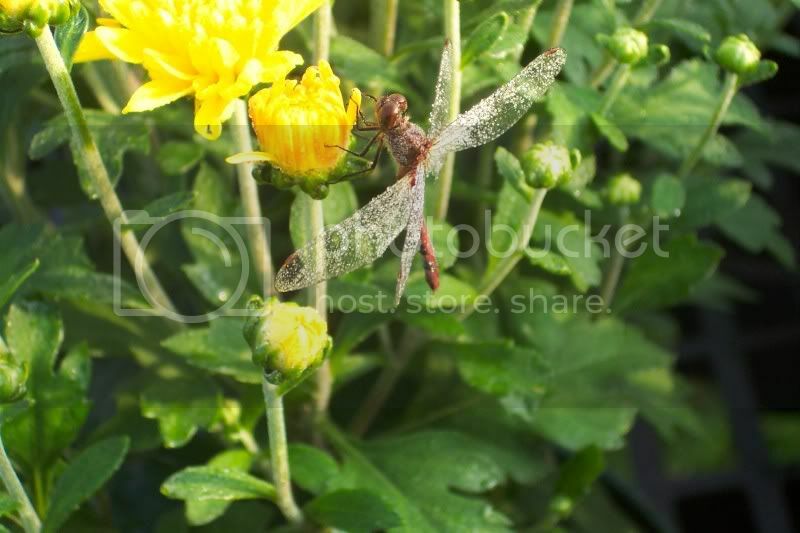 Recent international politics have been influenced by dew covered dragonflies and other insects. Former US Secretary of State and Ambassador to the United Nations, Madeleine Albright owns at least seven dragonfly brooches that she has worn during diplomatic visits to foreign countries. Here she is wearing a brooch in the shape of a bee during talks with Yasser Arafat…who knows where she wore the Dragonfly! These unexpected sights in the garden can really get you thinking of things. I better stop this “stream of consciousness” right here. Madeleine Albright’s book Read My Pins became available in book stores just last week.